ASCE 7 is the US standard for identifying minimum design loads forbuildings and other structures. ASCE 7 covers many loadtypes, of which wind is one. The purpose ofthis book is to provide structural and architectural engineerswith the practical state-of-the-art knowledge and tools needed fordesigning and retrofitting buildings for wind loads. The book willalso cover wind-induced loss estimation. 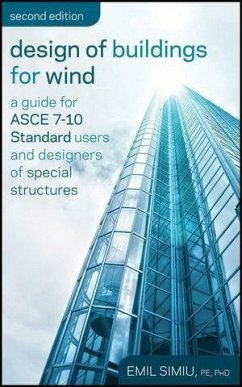 This newedition include a guide to the thoroughly revised, 2010version of the ASCE 7 Standard provisions for wind loads;incorporate major advances achieved in recent years in the designof tall buildings for wind; present material on retrofitting andloss estimation; and improve the presentation of the material toincrease its usefulness to structural engineers. Key features: * New focus on tall buildings helps make the analysis and designguidance easier and less complex. * Covers the new simplified design methods of ASCE 7-10, guidingdesigners to clearly understand the spirit and letter of theprovisions and use the design methods with confidence andease. * Includes new coverage of retrofitting for wind load resistanceand loss estimation from hurricane winds. * Thoroughly revised and updated to conform with current practiceand research.